We’ve had some sunny days here in Los Angeles, which I’ve been fully embracing with tank tops, flowy skirts, and sandals. 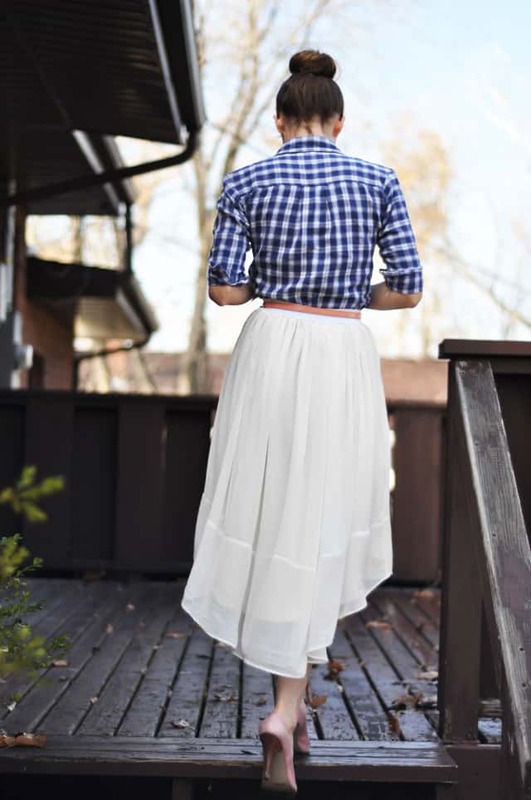 When I spotted this Sheer Gathered High-Low Skirt Tutorial from Cotton and Curls, I knew it would be one of my staples for spring. I’ve seen skirts like this in stores, but making it seems so much better! If you’re feeling the winter chill still, you can wear this cute skirt with a pair of colored tights or high boots. Sew a few more pretty garments just for you with the Cotton & Curls Tulip Wrap Skirt tutorial, Tulle Skirt, Men’s Button up to Women’s Button Up or the 3-in-1 DIY Swimsuit. Love the fit and flow of these skirts, especially when they are made out of sheer polyester material, so feminine. It is easy not one of the easiest to make because of the time commitment and the added lining, but the elastic waistband helps cut down on time and add to the comfort. I referred back to this tutorial! Its the skirt version. 1. Cut out 2 rectangles, one sheer fabric and one lining. The sheer material should be at least 1.5 – 2.5 yards long and as wide as your waist to the floor. Make only a yard long or at least as long as your hips are wide. You want this less long because it will create more bulk the more fabric you have. 2. Sew the to ends of the skirt part together and lining part together to make a couple skirts or tubes more like it. 3. Cut the skirts into a taper. Do this by laying the bottom flat so front of the skirt is facing forward and the one back seam of the skirt is facing backwards. Make sure the under skirts whether lining is cut a few inches above the sheer top skirt. 6. Gather the top of the lining and the skirt and sew them together with a straight stitch. Gather them to be as wide as your hips, the elastic will make it as wide as you waist. 7. Hem all the skirts. 12. Measure the elastic to fit stretched comfortably around your waist. Mark the elastic and the raw edge into fourths. Match up the markings. Sew on the elastic while stretching it to line up on the markings. I agree with this. 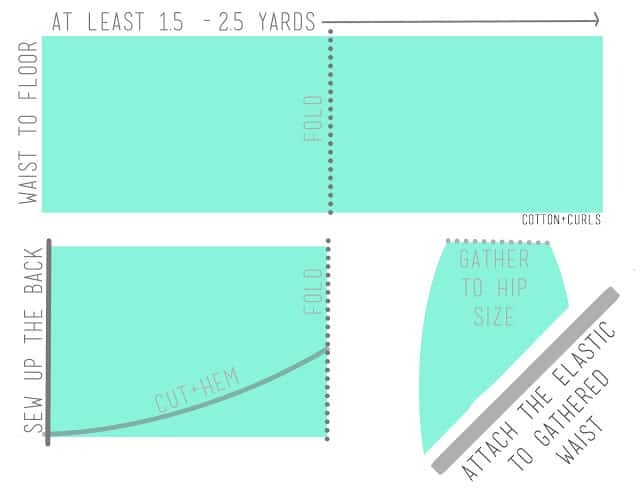 The only way you can figure this out is if you have been sewing for awhile and are spatially aware enough. The pattern never even says to sew the elastic waistband ends together prior to sewing it to the body of the skirt!! It looks like there are some steps missing. The numbers jump from 3 to 6, then from 7 to 12. I think it’s easy enough to figure out, but the missing numbers make it confusing. I know this is an old entry..but i am making this skirt this weekend and having difficulty understanding how to attach the elastic waistband. is it in a casing or just attached to the outside? Great images, but terrible grammar and directions! Please get someone to help you with this! She said refer to another tutorial guys. Linked it as well.